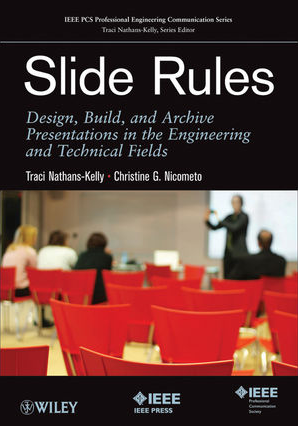 In early March 2014, the paperback version of our book Slide Rules: Design, Build, and Archive Presentations in the Engineering and Technical Fields became available for purchase. The e-book is available for download. Slide Rules is meant for engineers, technical specialists, and scientists–whether they are working for businesses, universities, research units, military sectors, or other areas. Professionals and students alike will benefit from this book because it provides specific avenues for improving and honing presentations in these specialized areas. Presentations in the technical fields are creatures of a different kinds, and the targeted needs for that work are duly addressed.